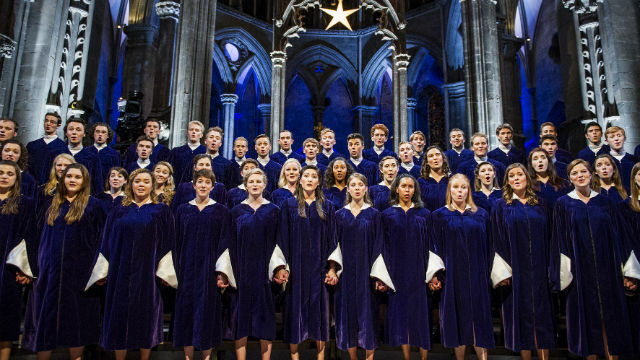 Christmas in Norway with the St Olaf Choir re-aired December 19, 2014. Travel to Norway for a concert in Trondheim’s Nidaros Cathedral by the St. Olaf Choir. Nidaros Cathedral in Trondheim, Norway, is the magnificent setting for an all-new Christmas special with the renowned St. Olaf Choir. This new concert pairs the internationally acclaimed mixed-voice choir from St. Olaf College in Northfield, Minnesota, with the Nidaros Cathedral Girl Choir, Jentekor. The production, recorded in high definition with 5.1 surround sound, showcases the cathedral’s spare gothic beauty — it is one of the oldest gothic cathedrals in the world — and its stunning acoustics that complement the distinctive style of a capella singing for which the St. Olaf Choir is well known. Selections include not only traditional carols, but also innovative arrangements of Christmas music ("The Word Was God and Lo," "How a Rose e’re Blooming/The Rose"), gospel spirituals ("This Little Light of Mine"), and beloved Norwegian hymns and folk songs. The St. Olaf Choir is conducted by Anton Armstrong. Anita Brevik conducts the Nidaros Jentekor. 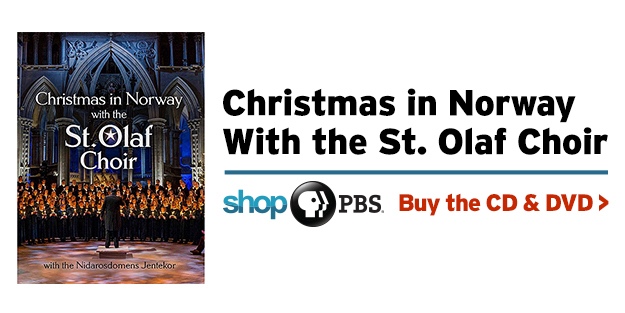 Christmas in Norway with the St. Olaf Choir is the 10th in a popular series of PBS holiday concerts featuring the St. Olaf Choir that have aired on public television over the past 25 years. This year’s concert celebrates the centennial of the choir’s first concert tour to Norway in 1913, under the direction of its first conductor F. Melius Christiansen, a Norwegian immigrant and founder of the college’s now-famous music program. In 2005 the St. Olaf Choir, under the direction of Anton Armstrong, performed another Christmas concert, A St. Olaf Christmas in Norway, for PBS from Nidaros Cathedral. Twin Cities Public Television and St. Olaf College.